The whole beard thing is going to get annoying very fast. From what I heard the new dress regs coming out are going to make it easier for beards. When I was in Pnr platoon the doctorine we used was that we would take our knowledge to the platoons, and use the rifle coy to do build obstacles etc while we mentored them as the SME. We also benefited greatly by going on Eng camps and compete against them as well as learn from them. Don't get me wrong pioneers returning to infantry battalions is great. I just find it annoying that growing beards seems like the first thing a lot of people care about. Id rather see pioneers (and mortars and TOW) as actual platoons in a regf infantry battalion rather than the sections that's planned with the other sections of the specialist platoons coming from the reserves. For all the benefits that come with reserves getting tasked with specialty roles I think some serious pitfalls come too. A battalion should have an internal capability to field a platoon and not have to rely on augmentation for specialty training. Though maybe the pioneers guys were always section level? Still true for TOW and mortars. Given that Pioneers and especially Mortars were some of the most dangerous things we used to do in an Infantry Bn, I would be very leery of penny packeting this capability at a section level, with augmentation to come from the Reserves. There were lots of mortar accidents back in the day. Thankfully in my days in Mortars, we were surrounded by Sgts and WOs who had spent most of their careers in Mor Pl, often only leaving to "tick the box" in a Rifle Coy upon promotion, and then straight back to Mortars at their new rank. The main problem with this whole 'give the reserves a cool Support Company type tasking so they will stay in' is, of course, the fact that all troops in a Support Weapons company have usually served several years in a rifle company first. As a result, they know what the rifle company troops need by way of support. My MFC in 1 PARA was a Sgt who had spent many years in a rifle platoon so thoroughly understood how the whole 'Company Attack thing' went down. As a result, when I worked out my fire plan with him it was based on a solid understanding of the realities of the infantry battle. s a result, he and his AC were basically my Indirect Fire Support' whisperers. Reservists? They won't have a clue. Most (99%) will never have even participated in a company attack. And I know that because I am one and, even though I've actually done the live fire thing with 81mm a lot in the past, am well out of practice! The same applies to Pioneers, Recce, TOW and the FSCC/ Sp Coy HQ, of course. We had good individual augmentation in the early to mid '90s from Reserve units who had a "Mortar Task", but I would have wanted a lot of work up for full mortar dets and especially MFC, Fire data calculations and FSCC. Thinking about Light Forces - especially a Light Infantry Battalion. Lets assume that the airlift is limited and by the time the Battalion and its kit is loaded there is only room for one large vehicle to be air-landed. Which would you rather? A tank? 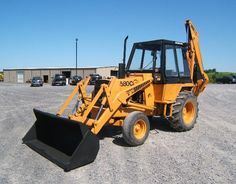 Or a Backhoe? Their weights are different but their volumes are comparable. To me, lacking armour protection for the battalion, having the ability to dig holes in which to get nice and comfy, has a certain appeal. Digging in mortars and guns might also be useful. A secondary task would be digging holes and ripping up bridges to make it harder for the other chaps to move would also be handy. Should the Light Infantry Battalions spend more time figuring out how they can best employ the Engineers? Backhoes, generators, water.... that kind of stuff? The reason that the Parachute Regiment and the Royal Marines practice marching long distances so much is that their doctrine is one of 'avoiding' the enemy's main force, and emphasizing the indirect approach. Tanks and bulldozers are not required in those cases. In the US Airborne and Marines, as we know, they take the opposite view. All that to say, your weapon and vehicle mix is usually driven by your doctrine. So.... does Canada have a doctrine for Light Forces? Or for that matter, its actual forces? Light infantry has to stick to hard to access places like cities, swamps, mountains. Any kind of armored, artillery or air threat is going to wipe the floor with light infantry IMO. Of the two a backhoe would be better but I don't think it would move around the areas light infantry needs to operate very well. I still remember receiving the first of 23 chalks in the Arctic, only to realize that planes don't carry their own MHE (should they?). We sat there looking at our stuff as we went and sourced a local forklift from the CO-OP, which we had to baby for if we put it out of commission, the community we were basing out of would be in the hurt locker. And the PTO comes in handy for all sorts of other stuff. If it can get on a C-130, sure. So.... does Canada have a doctrine for Light Forces? There is an ongoing Light Forces Initiative that is being taken quite seriously at a high level. The planning I've seen is robust and well thought out. If the regular force cannot figure out a way to effectively use the 3rd battalions then could easily be lost. Same goes for the reserves; we need to produce deploy-able assets for the army rather than just partly trained augmentees. Otherwise the reserves are likely be completely re-organized (in a way most of us in the reserves won't like) to reflect our actual output. Tasking the reserves with mission critical outputs is not a recruiting and retention tool, it is a serious effort to increase the army's agility and effectiveness. A great deal of staff effort and increasing amounts of money are supporting this, it's a real thing. If the funding and higher command support continue I think it's doable despite the challenges. There is considerable enthusiasm in my neck of the woods for the task we have been assigned, and we are definitely on our way to being able to deliver. I thought the Princess Pat were already light infantry. The PPCLI are called Light Infantry in there name because the founder thought it sounded good. The First and Second Battalions are Mechanized and the Third Battalion is considered to be Light. If we have three light battalions, it might make sense to have them rotate through three 'element' taskings, like Mountain, Maritime and Airborne. I'll trade you for 10k rounds of 81mm... THAT would be handy out this way. Kind of.... but you can only do so much with a Rifle Coy. If you have a full Battalion/ BG operating as Marines, or whatever, for 3-5 years then you can exercise your full range of support elements, and push the boundaries of the doctrine to the limits while building a real internal to the CAF experience base in that discipline. I have considerably more faith that the light force initiative will work out than the Res tasks. Given some of the high requirements to maintain some of those skills sets, get people qual'd and have them avail when req, I would be surprised if they do well on all fronts. I certainly hope they do but not holding my breath. Considering we only have 3 "jump" companies that are in different geographical areas, and considering our current manning issues, is keeping a (static line) Airborne capability in the regular army still a useful endeavour? Could we rebrand light infantry battalions as some kind of mobility/environmental force? Mountian ops, urban ops, recce, force protection companies?